Aloe vera juice is said to help maintain healthy digestion, and can also help regulate blood sugar, reduce inflammation, reduce acne eruptions, as well as many other health benefits, and is a good addition for those who are conscious of an alkaline diet. My Tío Eduardo swears by homemade aloe vera juice for digestive ailments. Homemade aloe juice is both easy and inexpensive to make—a single large aloe vera leaf in the produce section of most grocery stores in the U.S. should cost between 99 cents and $2 or $3. If a single leaf is $3 or more, it should be very large and heavy, otherwise check another store for a better price. Most Mexican or Latin American markets will carry them. Aloe leaves available in grocery stores are typically about 4-4.5 inches wide at the base, 22-24 inches long and about 1 inch thick. Bottled aloe vera juice sold in stores often has a lot of added ingredients—some of which you may not want to be consuming, including artificial colors or flavors. Also, aloe juice supplements sold in health food stores can be overpriced and are not really regulated closely by the FDA. If you’re not keen on reading labels or spending a lot for a fancy natural juice at a health food store, homemade is a better route to take so you know exactly what’s in your juice. So, why not just make fresh aloe juice each time you want to drink it? In our 30s, I’ve been more prone to indigestion as my metabolism changes, and my husband sometimes struggles with acid reflux. 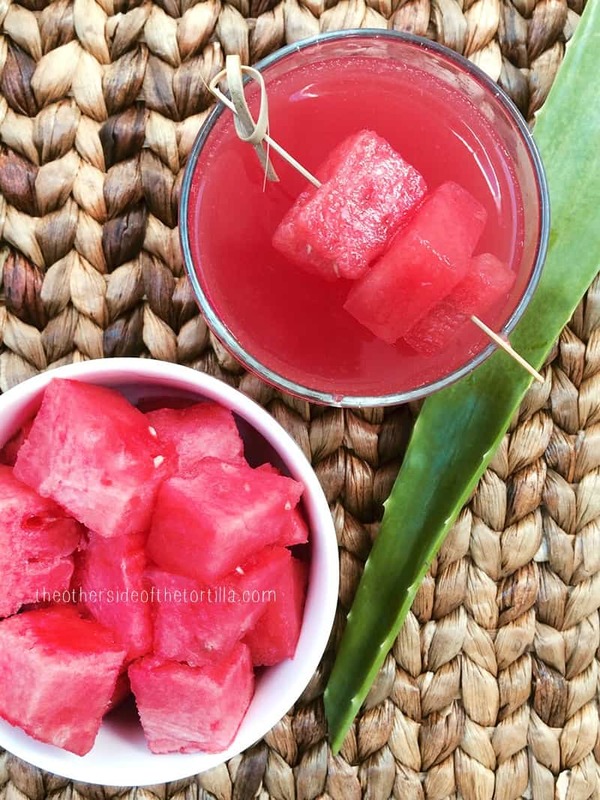 This watermelon and aloe juice recipe has helped both of us reduce flare-ups and avoid taking medications in most circumstances. I notice when I drink this juice a few times a week, my skin also stays remarkably clear and the only thing I need to do as a daily skincare routine is wash my face with a gentle cleanser and apply a little moisturizer. I usually prefer to try the natural route of changing out diet when it comes to digestive ailments rather than spending a lot of money and time on trying out OTC or prescription medications. Since aloe helps regulate the digestive system, be conscious not to go crazy and drink more than one or two servings per day. If you don’t like to add ice, you can also substitute frozen chunks of watermelon to keep the juice cool while drinking it. I like to put cubed watermelon on a cocktail pick and put it in the freezer, then serve this juice with the pick on top like pictured so the person I serve it to can choose whether to use the watermelon chunks as ice cubes or eat them as a frozen little snack instead. This watermelon and aloe vera juice is light, refreshing and can help ease digestive ailments, as well as provide other health benefits. Wash and dry the aloe leaf, then place it spike-side down on a cutting board. Using a sharp knife, cut along the edges of the leaf to remove the spikes, and cut off the bottom and top of the leaf. This should expose the gel on all sides. Run a sharp knife under the green skin on one side until you remove it completely. Be careful not to cut too much into the gel. If you notice that there’s any yellow ooze on the aloe gel from the skin, that’s aloe latex—which has laxative properties. You can wipe it off with a paper towel or rinse off with cool water. Once you’ve removed the first side of skin, score the gel into one-inch squares. Scoring the gel first will make it easier to remove in pre-portioned chunks. Edge the knife along the other side to remove the other green skin. Check for yellow aloe latex and remove or rinse it from any of your one-inch square pieces of aloe gel. Juice fresh watermelon through a juicer until you have 4 cups of juice (see recipe notes below if you need to use a blender instead of a juicer for modified steps). 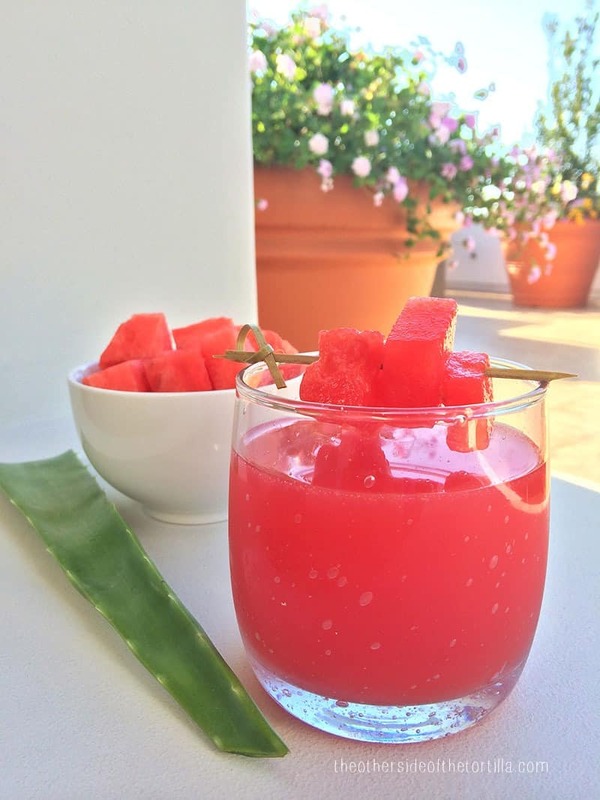 Add 4 cups fresh watermelon juice to blender with 2 cups cold, filtered water, and 10-12 one-inch aloe gel cubes. Blend on high until aloe gel is completely liquified. Serve over ice immediately or store in refrigerator in an airtight container for up to 5 days. IF USING A BLENDER TO JUICE WATERMELON INSTEAD OF A JUICER MACHINE: Juicing watermelon is easiest with a juicer, but you can also use a blender to do it. If you use a blender, you'll need to add the watermelon and water to the blender, then strain through a fine mesh sieve to remove any pulp. Rinse the blender out before returning the filtered juice to blend with the aloe gel. JUICE STORAGE: This juice should be stored in an airtight bottle in the refrigerator for up to 5 days. STORING EXTRA ALOE GEL: Store any extra one-inch aloe gel cubes in a plastic zippered bag or an airtight container in the refrigerator and use within one week. Disclaimer: I’m not a doctor, and neither is Tío Eduardo, and this information is not intended to be taken as medical advice. It is purely anecdotal and our personal experience. If you have any kind of chronic medical condition such as diabetes, are pregnant or breastfeeding, or take prescription medications, consult your physician before adding aloe vera juice to your diet to make sure it’s right for you. If you have known allergies or sensitivity to plants of the Liliaceae family, including onions, chives, leeks, asparagus and garlic, you should avoid consuming aloe before consulting your doctor. If you experience discomfort, stop consuming aloe gel or aloe juice and consult your physician. Aloe juice is not intended to cure sudden, severe digestive pain. I just inherited a large aloe plant—can’t wait to try making my own juice!